In the world of narcissist support groups, there are a lot of terms that we get used to using. Phrases like “flying monkeys,” “overt and covert narcissists,” “scapegoat and golden child,” and more. People who are just learning about narcissism are often overwhelmed by the jargon and learning the basics. This book is a really great start for learning about narcissism. The author addresses dealing with narcissists at work, in relationships and in one’s family, so all of the basics are covered. She uses the Wizard of Oz as a metaphor because narcissists fool people and rely on illusions to do so…just like the great Wizard of Oz was really just a regular guy behind a curtain, yet had everyone tricked about his powers. That is incredibly true and it’s something that has bothered me many times. There are people who have seen my ex narcopath or my mom going into rages and become abusive, but the people who KNOW what is going on and will admit it are the same people who rush to cover it up and protect the narcissist. I just do not understand it. In fact, I even made a meme about it! 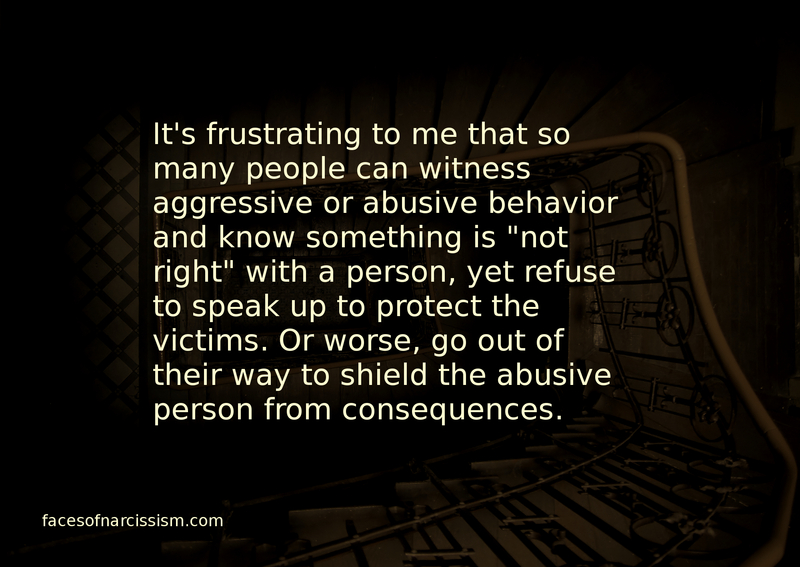 It’s frustrating to me that so many people can witness aggressive or abusive behavior and know that something is “not right” with a person, yet refuse to speak up to protect the victims. 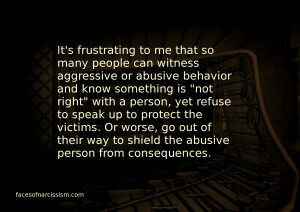 Or worse, go out of their way to shield the abusive person from consequences. I remember that so clearly from dealing with my first narcissistic ex. I kept thinking that his behavior seemed really irrational and mean, yet he had me convinced that it was my fault he acted that way. My head knew that made no sense, but he was so insistent, I felt very confused about whether or not my reality was correct. Fortunately, I had a therapist who knew both of us and was able to remind me that I was right when I felt like he was abusing me, but his thrall was very powerful. I started the marriage as a happy person and ended it a stressed-out shell of my former self with no self-esteem left. This is definitely an essential book for learning about narcissists, validating your reality and figuring out how to deal with them. If you are joining support groups or reading web pages about narcissists, it will also help you learn some of the popular terms we use when we talk about them. My narc never had me confused as to who was wrong. I was just wanting to forgive him for not knowing better.